Well sort of. The other week we had the fun of having most of our heating ducts torn out and replaced to get rid of some asbestos and add A/C. They also gave us a new thermostat for reasons that are beyond me, the old one has exactly the same functions but is slightly easier to use. These cheap thermostats are all the same, same functionality, almost identical controls and all terrible to use. This new one requires me to set 48 different values to set the schedule and then despite clearly having a basic micro-controller in there still requires me to flip a manual switch to select between heating and cooling. We had been offered more expensive options like Nests, but they are all way more than I need and $200 is kind of ridiculous for something that really should be set and forget. Which got me to wondering just how hard it would be to knock up something that did a decent job myself. Turns out that all most thermostats spend their lives doing is connecting wires together. There is a common line, connect the heater wire to it and the heat comes on, connect the AC line to it and the condenser comes on, etc. So all you need is a simple controller, some outputs to drive relays, some buttons for controls and of course a temperature sensor. Well I had all of that in my cupboard from other projects. Oh and an Xbee module. Might as well have some fun right? 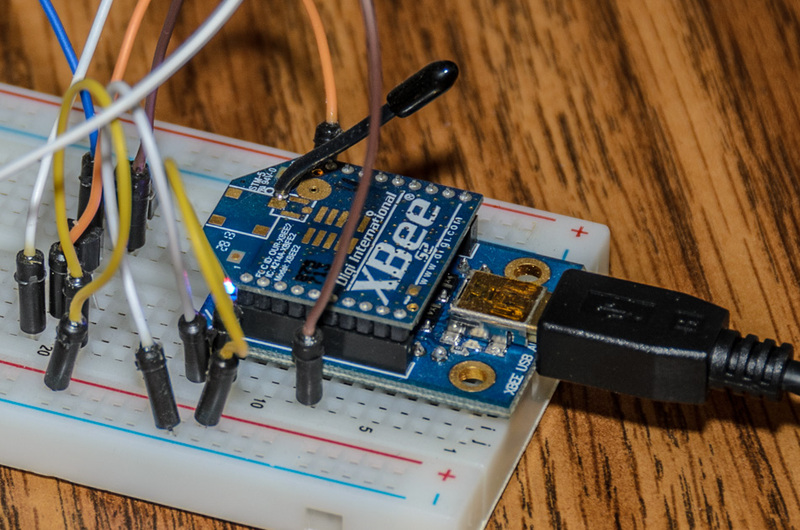 Xbee’s are fantastic little devices that are cheap and automatically form wireless mesh networks letting you transmit serial data around with next to no set-up. They also have analogue and digital input and output pins that can be read and written remotely, you don’t even need an additional micro-controller. As it happens I had a second temperature sensor handy that outputs as a simple voltage which a remote Xbee can read and periodically send updates about so with that my thermostat can sense the local temperature and the temperature in any room I put an extra Xbee into. I got the basic code mostly working too so now I guess I get to decide if I want to do this properly or not. I’d need to add actual relays to control the HVAC systems. There is no plug outlet near the thermostat wires so it needs power too. Happily the thermostat wiring includes 24VAC just for thermostats to use, should be simple to convert that to the 5V the Pi runs off though I’m not too sure on current availability. I’d probably switch out the 1-wire temperature sensor for either a plain analogue one or an I2C option since I’m already using that for the display anyway though a bigger display would be nice too. A Pi Zero which is both smaller and more powerful than the old model B model that I’m using here would be a good idea but as far as I can tell no-one has any in stock right now. Once you throw all that together you’re probably still getting close to $100 for the main unit and one remote sensor which is getting on the pricey side. But then since I’d have complete control of the code maybe that would be worth it. It blows my mind that these sorts of tools are cheaply available now. When I was a kid and playing with electronics I got to use logic gates to do fun things. Maybe every once in a while a tiny barely useful micro-controller which you programmed in assembly. I remember buying a kit that attached to the ISA bus (that ages it!) of an old PC to give you I/O lines to play with. I don’t remember the cost but I know for sure it cost more than an entire Raspberry Pi costs today. The idea that you can buy basically a full computer with easily accessible inputs and outputs for just a few dollars is incredible. I can’t wait until Chloë wants to experiment with this too. I guess it depends on whether it uses less energy to provide a low background heat to maintain the steady state or to do short bursts of high heat. The former is certainly going to be more comfortable though.